HOME > Our Work > SNACK! In Chatham County, 50% of public school children receive free or low cost meals (breakfast and lunch) through the National School lunch Program because their family income is at or near poverty level. More than 4,300 school children in Chatham County may not have adequate replacements for these meals during the summer in 2019. SNACK!, a grassroots food program established and administrated by CORA, picks up where school lunches and Backpack programs leave off. Ten weeks of nutritious meals are provided to kids who would have no way of receiving these meals during the months school is not in session. Every two weeks, food for every breakfast, lunch, dinner, and snacks are distributed to families whose children are enrolled in the program. Our 2019 goal: 1,550 kids served (an increase of 100 kids over 2018). If you would like to partcipate in this program, please register HERE. 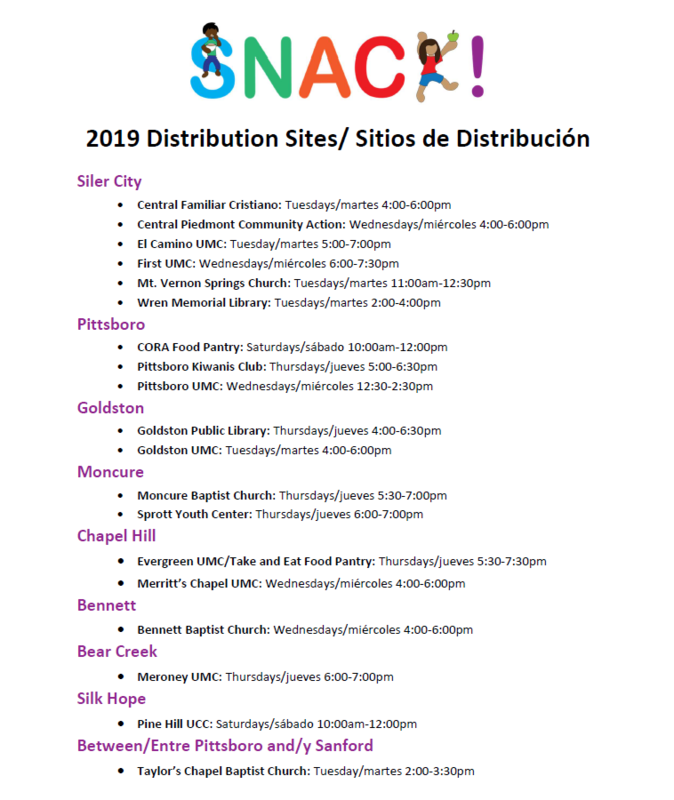 Families with children who receive free or reduced lunch enroll their eligible children to collect food from their choice of 18 or more distribution sites located throughout the county. Register online HERE or visit one of the following sites. SNACK! runs from mid-June to mid-August for 10 weeks. Beginning in the summer of 2016 food distribution changed to “child choice.” Instead of giving each child a pre-packed box of food, foods are displayed like a small grocery store and parents and children are able to choose from several items in most categories (protein, vegetable, fruit, etc.). Kid choice better serves the needs and preferences of individual families and better engages children in the food selection process. Click HERE to print a complete list of distribution sites. Children will get enough food for 21+ nutritionally balanced meals (seven breakfasts, seven lunches, seven dinner, and healthy snacks) each week during summer break. This includes fresh local produce from our community food partners. CORA Food Pantry oversees management of SNACK! Each summer, many local organizations help with distribution from every corner of Chatham County. This past summer, 18 groups from libraries, youth centers, churches, Kiwanis, and others offered time and people resources to make the program a success. The cost of the SNACK! program for one week for one child is only $15! Won’t you help by sponsoring one or more of these deserving children during the summer? You can sponsor a SNACK! child for the entire summer with a donation of $150. You can make a one-time gift or give $13 monthly. For more information on being a SNACK! Champion, please contact Rebecca Hankins at 919-491-5896 or rebecca@corafoodpantry.org.